Meal planning can sometimes be tricky in our house due to my desire to reduce the amount of meat (including seafood) that I eat and my husband’s wish to have meat with most of our meals. Luckily, we’ve come to a compromise where I tend to avoid meat at breakfast and lunch and only have it with dinner two to three times per week. While Brandon still loves bacon breakfasts, turkey sandwiches at lunch and a steak for dinner, he is very willing to also have a couple of meatless dinners every week. I find that it’s fun to experiment with ethnic dishes for our meatless mains. It seems like there are endless options ranging from curries to stir fries to pastas and much, much more. I recently got the idea in my head to make sesame ginger maple tofu and was pleased to discover a similar recipe on Eating Well. I loved that the sauce also included tahini. This dish was so easy! Everything is roasted together in the oven with the sauce being drizzled over the tofu and vegetables towards the end of cooking. I served it over soba noodles. I made a few alterations to the recipe by adding fresh ginger, doubling the sauce and including carrots and green pepper with the veggies. 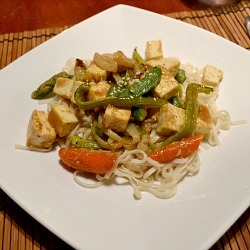 The sauce was so flavorful and really soaked into the tofu and veggie mixture. I think that you could substitute a variety of vegetables in this depending on your preferences and what you have on hand. Also, I think that this sauce would be great with shrimp. The leftovers were just as good the next day. I served them over a bed of spinach with brown rice and a generous squirt of Siracha. This is a healthy and delicious vegetarian dish that should be added to your meatless main rotation! Preheat oven to 425 degrees. Prepare a baking sheet by lining with foil (for easy cleanup) and spray with nonstick cooking spray. 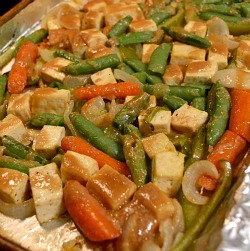 Place tofu and veggies on a baking sheet and toss with oils, salt and pepper. Roast for about 20 minutes, shaking the pan from time to time. Drizzle all over with the sesame ginger maple sauce and continue roasting for another five minutes. Serve over soba noodles, rice noodles or brown rice. This looks so good! 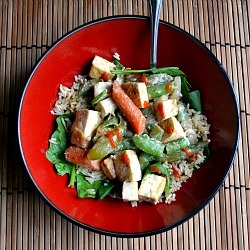 I’ve been trying to add more tofu to our meals as to reduce the amount of meat we’re eating. Can’t wait to try this! We will have to try this! I am trying to incorporate more meatless dinners into our weekly menu, so this one will have to be added! Thanks Jen! This looks scrumptious! Can’t wait to try! I think I gained a bazillion calories just browsing through your photos. Thank God they’re all virtual 😉 Great blog.